Having been a VR enthusiast since an initial magical experience in the 90s, I have spent my graduate degree in Anthropology focusing on further integrating this visualization technology as a method of immersive historical education for archaeological sites. I am really excited to be working with the Student Innovation Fellowship’s interdisciplinary team on 3D Atlanta. This reconstruction of 1928 Atlanta surrounding the area where Georgia State currently sits allows me to dive into the creation of these immersive spaces, both from an archaeological perspective and as an interpretive artist. If you haven’t experienced 3D Atlanta in a while, the addition of the ChronoLens, which orients the viewer within a modern ‘streetview’ of the location, really makes the experience relatable. Where a parking garage sits now, there used to be the beautiful Victorian Kimball house (http://sites.gsu.edu/innovation/2016/09/21/3d-atlanta-big-update/); Classroom South sits on land formerly home to a deco movie theater. The world becomes both familiar and unfamiliar as you view through the giant lens into the modern world. Another addition that I am very excited about is the inclusion of artifacts within the world. During both my undergraduate and graduate work in GSU’s Anthropology department (http://anthropology.gsu.edu/), I worked on the Phoenix Collection (http://anthropology.gsu.edu/phoenix-lab/), an assortment of artifacts curated by the college that were collected during the initial excavation of the MARTA line during the 1970s. Many of the artifacts that are curated within the collection are attributed to the late 1800s through the 1930s, providing us with period-accurate material culture to help populate our city. Currently, the streets are cobbled and lined with buildings from that era, many replicated in accurate locations based on photos, but the world can be eerily silent. By adding artifacts, a form of dynamic interaction can now be played with by the viewer, and the experience again takes on new layers of education and fun. 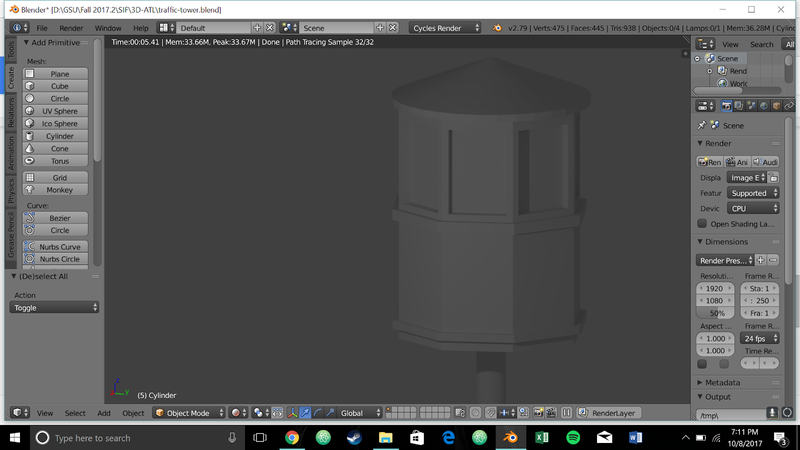 I wanted to model something for the project, but as I have been teaching myself modeling through various online courses and harassing skilled friends, I wanted to first try something small. Along with a group other SIF’s that are just getting comfortable with 3D modeling, I scoured through archived photos from ATLmaps (https://atlmaps.org/) and GSU’s library (http://digitalcollections.library.gsu.edu/cdm/collections), trying to find something unique. We found great examples of fire hydrants, street lights, billboards, and awnings, but I was continually struck by images from 5 Points. 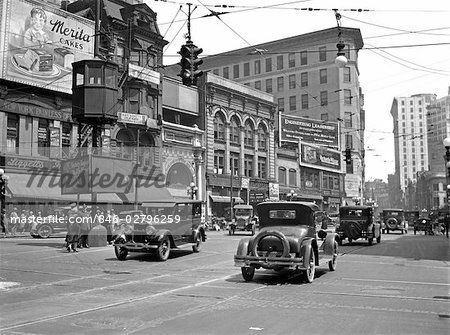 Not only was the 5 Points from 1928 unrecognizable from the area today, but sitting in the middle of the 5 intersecting streets is a box, large enough for one or two people, suspended above the road on a pole. I immediately became fascinated with this strange, seemingly inconveniently placed box at the nexus of historic 5 Points. 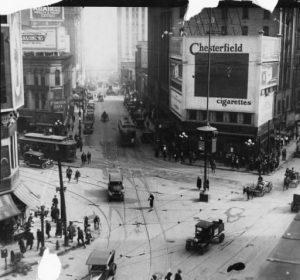 My first theory was that it had something to do with directing the traffic, due to its placement in the convergence of busy streets. As I looked at photos through the continued chronology of the area, I began to notice that it is often pictured with power lines connecting to it. A sign featuring a police office also seemed to be related to the box in one image. As police officers were the original traffic directors before the invention of lights, I began to see why this suspended box in the middle of the road may have had an advantageous position for this use, by protecting the police officers while allowing them to see all angles of oncoming traffic and pedestrians as the ubiquity of automobile traffic increases over time. Additionally, in some photos, there seems to be a relationship to the box with traffic lights and power lines, further strengthening my original hypothesis. To research this, I headed over to GSU’s library access to JSTOR and looked up information regarding early forms of traffic control (McShane 1999). 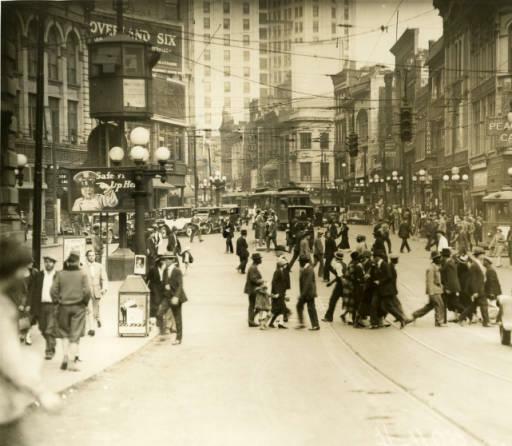 When cars became more popular along the streets, police officers were the first directors of traffic. Many people tried to invent systems of traffic communication that could be heard and seen by the horse-carts, autos, and pedestrians that shared the roads. These original designs were mostly based on the signals used by trains, including a red and green light (yellow was added in 1917 by Detroit police officer William Potts) and a loud horn. 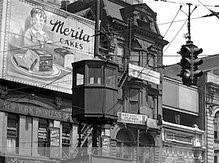 Busy intersections maintained manned and unmanned towers as these lighting signals gained more common installments. 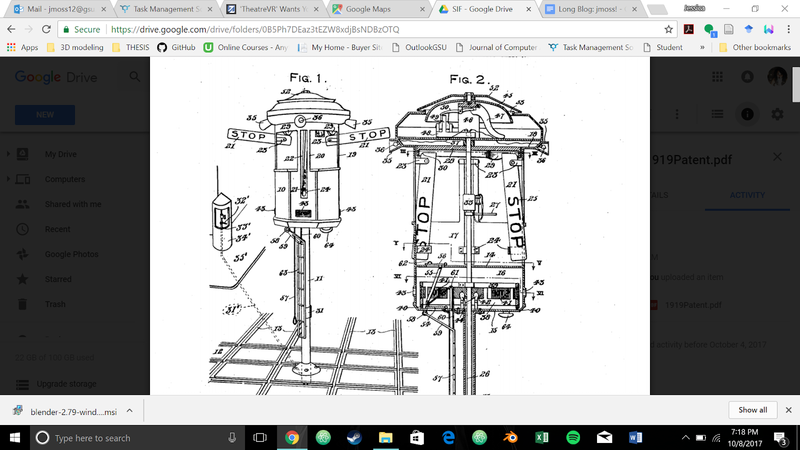 I then headed to Google’s patent search and began to look for information regarding early forms of traffic communication. 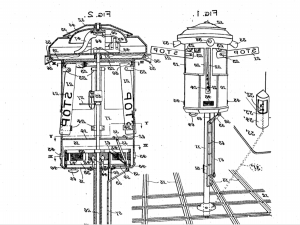 I found several versions of early automated traffic towers, showing that prior versions had been of a similar style and manually operated. So, at this point, I was confident that I had found the original use of this box. It was time to start modeling. 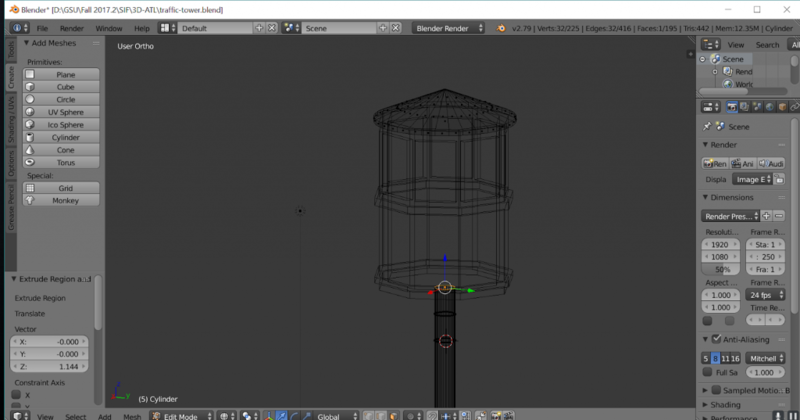 I began by creating the basic octagon shape of the box. As the box is made with fairly simple geometry (cones, cylinders, and polygons), I was able to craft the basic shape of the box through Blender using some simple techniques. I used the sharpest of the images of the tower to craft the details of the lips and windows. I wasn’t sure if we were going to texture the windows or if we wanted to cut them out, so I hollowed out the box. Additionally, I left a small plane over the windows in case we need to add texture to them. So far, it seems easier for me to remove minor details rather than add them back later. 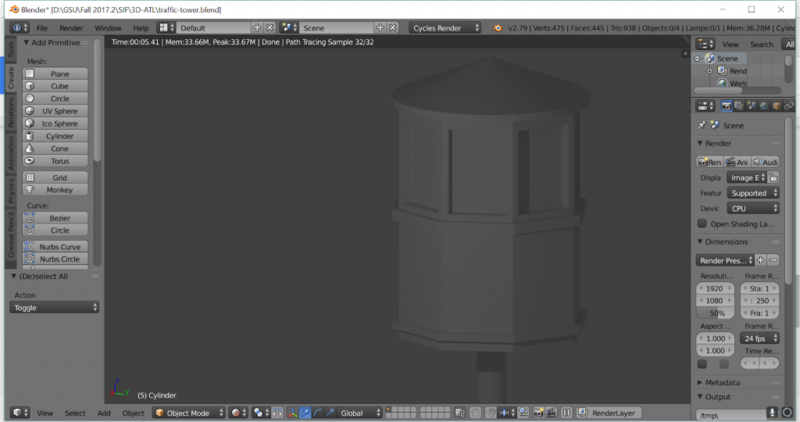 After a lot of trial, error, CTRL-Z presses, and tweaks, I was able to get a basic shape of the tower. My next step will be to present this at our next SIF team project meeting to get feedback from the group how to best blend it into the project as a whole, and we will discuss the next steps of texturing. 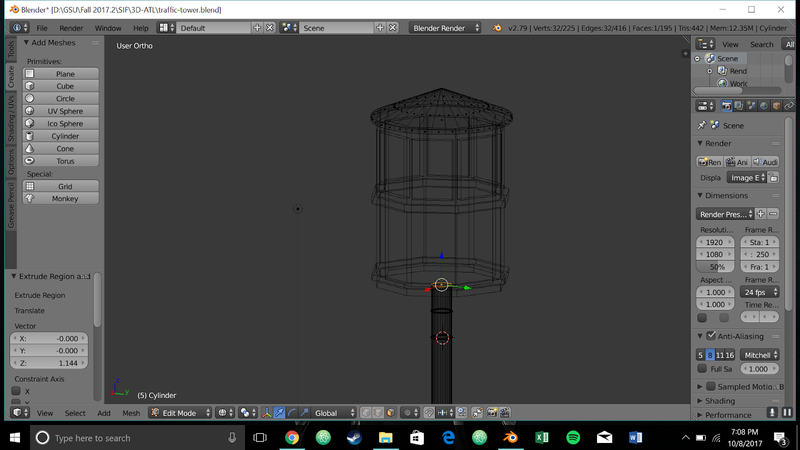 I still have a long way to go (cleaning, scaling, and texturing the tower) before it can go into the world of 3D Atlanta, but I really like my basic shape! It will be fun to see how this fits into the entire project!